Pre-history may have to be re-written following a recent dig by university students near Stonehenge. Signs of human habitation 8,000 years ago have been discovered by Archaeology MA students from the University of Buckingham, led by senior research fellow David Jacques. Mr Jacques said: “This year we’ve found burnt flint – a sign that people had made fires, so were in the area, around 8,000 years ago. “The finds will have to be carbon-dated to get a precise date. 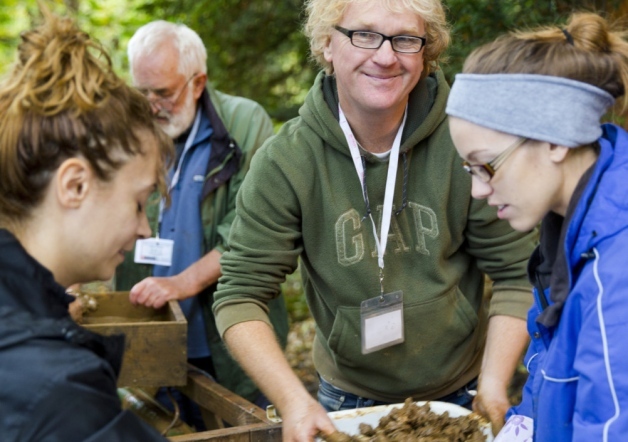 The archaeologist, who is leading the new Archaeology MA course at the university, has just completed a two-week dig at Vespasian’s Camp, a mile from Stonehenge, at which MA students and University of Buckingham staff worked as volunteers, sifting through remains. A number of ancient flint tools were among the finds. More than 12,000 items from the mesolithic era (8000 – 3500BC) have been uncovered, including hunting tools, the cooked bones of aurochs – a gigantic cow-like animal – deer, wild boar, and even toads’ legs. The finds have revealed that the site was in use continually for over 3,000 years, and could even be the reason why Stonehenge is where it is. Mr Jacques suspects the site will contain evidence of settlements, which would be some of the earliest ever found in the UK and would completely change our understanding of this era. Mr Jacques appeared on TV this year in BBC 1’s Operation Stonehenge and BBC 4’s The Flying Archaeologist. And the MA students working alongside him at the dig a fortnight ago found themselves being filmed for a forthcoming episode of Horizon. Digs at the site over the last few years have already yielded a staggering 32,000 artefacts dating from as far back as 7500BC. Last year, the dig resulted in 8,000-year-old burnt frogs’ legs being found, revealing the delicacy was originally English and not French. Earlier this year, carbon dating of finds from the dig led to the revelation that Amesbury is the oldest town in the country. A previous public lecture by Mr Jacques at the university drew a packed audience. Following the latest dig, Mr Jacques is returning to deliver another public lecture on Thursday, November 13. The free event will take place at 6.30pm, in the Chandos Road Building, as part of the university’s autumn concert and lecture series. In the lecture, Mr Jacques will unveil startling new evidence showing how the mesolithic period influenced the building of Stonehenge. The lecture will focus on the area around the dig, Blick Mead, which features a natural spring, which would have attracted settlers to the area. The warm spring water has caused stones to turn a bright puce, a colour of stone not found elsewhere in the UK. David Jacques was elected a Fellow of the Society of the Antiquaries (FSA) in recognition of the importance of his discoveries there.